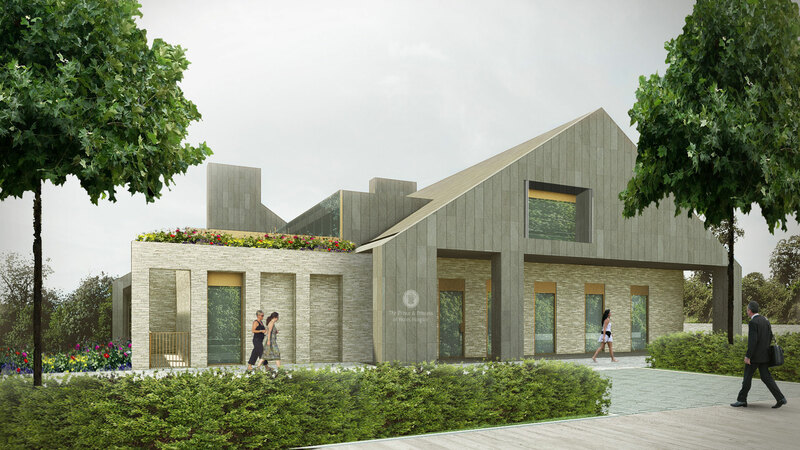 Glasgow’s Hospice for The Prince & Princess of Wales, is proudly nestled into the sloping site of a former Glasgow City Council Garden Nursery at Bellahouston Park, Glasgow. A new reinforced concrete structure with external covered balconies and landscaped gardens, will provide much needed new environment to extend and enhance their unsurpassed palliative care facilities to the people of Glasgow. The challenging topography of the site has led to an extensive earthworks exercise, cumulating in a balanced cut & fill, with the building being constructed into the sloping site. The building will consist of a three storey reinforced concrete frame with flat slab construction allowing for an uninterrupted ceiling space for the interface with the services strategy. The upper portion of the building is steelwork framed to create the dual roof pitches, with the roof overhang supported on the external balcony structures, all clad in slate to provide a seamless fabric to the building exterior. The external areas are fully landscaped with a series of seasonal gardens and the rear sloping area of the site has been utilised to provide a meandering walkway to sheltered viewing spaces. The building is served with a new car park, with a clever design of structured planting to effortlessly blend the new construction into the established park surroundings. A sustainable urban drainage design system is designed to work in harmony with the sculpted topography, with the rainwater being circulated for the new water features.